A slow Newport Bermuda Race is a frustrating and tiring event. After doing circles in light air Tuesday night the crew of Momentum, a Hinckley Sou’wester 51, were all glad to finally get a decent breeze for the last 40 miles and had a fun romp to the finish. We were psyched as we chased down a larger Hinckley in our class, finishing just 14 seconds behind her! We were ready for the customary Dark ‘n Stormy after the race. When all was said and done, we finished fifth in class on corrected! The owner, Dr. Paul Kanev, was thrilled; a great performance in his first Newport Bermuda Race with Momentum. After the parties and awards ceremony were over it was time to head home…cruising mode! My wife Jan was to join us for the return. Paul, with a penchant for solo sailing, would take one watch, Jan and I the other. The protocol for this trip would be full-on cruising mode; if the winds were light we would motor, and unlike racing the autopilot was fair game. After all, jobs were waiting and there was some unsettled weather off Florida. We had received a great forecast from Seth Saslo, a Branford, CT resident who has recently received a Masters from UCLA and is now working on a PhD in meteorology from Penn State. He had frankly told us we had better be in Newport by Thursday night as the likelihood of heavy weather was a real possibility Friday or Friday night. Being as Seth is an experienced offshore sailor having done this trip several times himself…we listened. We soon fell into the watch schedule; we used the so-called “Swedish Watch,” being 6pm to noon, noon to 6pm, 6 to 10pm, 10pm to 2 am and 2 to 6 am. It’s a popular system, with a nice chunk of time during the day to sleep. Alternating nights you get either two four-hour watches: 6 to 10 then 2 to 6, or one night watch from 10 pm to 2 am. The 6-10 and 2-6 am give you beautiful sunsets and then nice sunrises. The 10pm- 2 am is a bit tougher but with little or no moon, as we had, provides the ultimate opportunity for seeing stars as nowhere else on earth. The weather held clear and mid-way back we had one of the most spectacular ‘star shows’ ever! It’s hard to find words to describe the beauty and grandeur of the Milky Way. 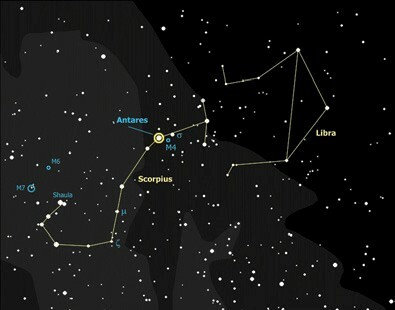 On this night it crossed the sky from the constellation Scorpio in the south, ran almost directly overhead, split into a two-lane highway of stars and ended in Cassiopeia to the north. Every time you looked a little closer at apparent gaps between stars you realized they were filled with even more stars of a slightly lesser brilliance. The constellations were dramatic and easy to find, making it understandable how the imagined shapes could be conceived by the ancients. Keeping watch in good weather is fairly easy. With all the electronic niceties like a multi-function display at the helm, AIS, radar if needed, sea temp readout on the Ockam, and the autopilot faithfully holding our course, all we had to do was keep a good visual lookout…lots of time to gaze at the stars and make up stories. There behind us was the evil Scorpio spreading across the southwest sky, complete with curled tail sporting a wicked barbed point! Ahead of the advancing Scorpio were the twins Castor and Pollux who also advanced as they seemed to be trying to get away. After a few hours, the twins had no chance of escape and slipped silently into the sea. And so it went, and soon the watch was up and it was time for a few hours of delicious sleep. 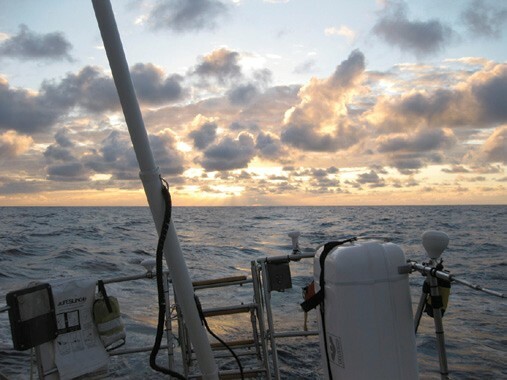 Coming up the rhumbline, the water had been gradually warming as we approached the area of highest Gulf Stream activity. Seldom is the Gulf Stream relegated to a single 50-mile river of current as it is often described. Rather it is often a vast area ranging between two hundred miles or more and containing a mixed bag of meanders, eddies and filaments of various temperatures and current speeds. We suddenly found ourselves in water that was over 80 degrees and slowing our progress by more than two knots! Looking at the latest Gulf Stream charts downloaded in Bermuda, we took a course of action that would make a coastal sailor cringe; we altered course 60 degrees to take us out of the foul current. We watched the sea temp carefully, and within the four-hour watch the temp had dropped to 76.5 and as we turned back toward Newport we actually had a half-knot boost. A less aggressive course change would probably have left us in the foul current longer, a lesson we learned ‘the hard way’ on the 2008 return trip. One day blended into the next with the stars, the dolphins putting on fabulous ‘air shows,’ and various birds keeping us entertained. All part of the fabric we call “cruising.” Like racing, it gets better the more you do it. Little lessons learned are stored in the satchel we call “experience” and when a situation rolls around again, hopefully we apply the experience to make our trip less stressful and more fun. Thursday sunrise found us 30 miles off Newport, on schedule, slightly slower as we used all the electronics to deal with a pea-soup fog welcoming us back to New England. The VHF, after long periods of silence, crackled with activity; we were home. Did we take some photos? A few, but the real beauty comes from the motion of the birds, the clouds, and the dolphins, on a sea and sky so vast no lens can capture the complete picture. Shared with friends, new and old, even better. So gear up your little boat, or crew on another, but get out there and experience the wonder we call cruising. It can’t be captured on film or in words – you must be there! A sailor since the 1970s, Ernie Messer is a member of the Cruising Club of America, Off Soundings Club and Shennecossett Yacht Club. He and his wife Jan have sailed New England for many years and have also raced to Bermuda frequently, including three times double-handed! They sailed for 15 years on their Tartan 41 and now sail on a restored Peterson One-Ton, Valour, out of Westbrook, CT.